Pure organic source of phytonutrients, enzymes and chlorophyll for a powerful aid in building levels of endurance, immunity, healthy cell growth and maintaining a resistance to fatigue and illness. High in antioxidants such as vitamin C, S.O.D and minerals such as calcium, iron, magnesium, manganese, phosphorus, selenium and zinc. Natures whole foods in every teaspoon, organic Mayella ® Green Harmony is a rich source of soluble fibre, containing a full spectrum of vitamins, minerals, easily absorbed and digested plant proteins and valuable phytonutrients such as Chlorophyll and vital enzymes such as S.O.D (Superoxide Dismutase) to assist in key body functions and maintaining immunity. 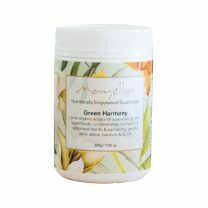 We are proud to offer you Mayella ® Green Harmony, 100% grown, harvested and manufactured in Australia. 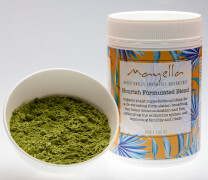 Mayella ® Green Harmony is a pure organic source of 100% Australian grown superfoods. Australian grown by default guarantees clean green unpolluted environment and pristine conditions nourishing and nurturing young shoots to an optimal age for harvest. Organic and ethical farming practices ensure with harvesting & with specialised processing we are capturing maximum vitality and nutrient content for the benefit of your health and wellness. Every gram of Mayella ® Organics offers concentrated plant based nutrition for optimised health & wellbeing in totally vegan capsules and powders. Daily supplementation with Mayella ® Green Harmony as a dietary whole food, provides a natural source of concentrated nutrition for cellular health and vitality for a lifetime of health and wellness, safe for the whole family. It is in the vitality of the green shoots that a natural abundance of essential nutrients are found, 100 percent Gluten Free and easily bioavailable. 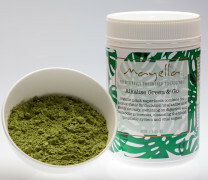 Mayella ® Green Nutritional Blends are 100% pure, clean vegan superfoods. Made by us here in Australia for you with the ultimate in good health in mind. Gluten free, dairy free and no fillers, sugars or bulking agents such as maltodextrin, just concentrated whole foods as Mother Nature made them with a little help from us to get them to you, in your daily life. We source globally from the optimal geographic destinations, and it is our privilege to work with growers of fairtrade and sustainable origins. Our organic Alfalfa, Barley Grass, Wheat Grass and Oat Grass are proudly Australian grown and are the best in the world for optimal nutritional content, sustainable and clean farming practice. 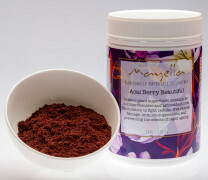 You will taste the healthy difference with Mayella ®. *While we know the health giving benefits of our products are of value when your body is tired, stressed or unwell, everyone is unique in their health and needs. Please consult your health practitioner before beginning anything new as they know you best. An organic daily nutritional source of natural bio-available vitamins, minerals, phytonutrients, essential fatty acids complex amino acids and enzymes for a building block towards greater health, wellbeing and longevity. As a daily nutritional source, mix 1 – 2 teaspoons of Mayella ® Green Harmony into a tall glass of filtered water, natural coconut water or your favourite fruit/vegetable juice. Alternatively, our alkalising super blend can be added to your favourite smoothie or protein shake as an additional nutritional boost. Store in a cool dry place, below 30°C / 86°F. Empowered smoothies and other alkalising recipe ideas are available on our blog or free to download e-books. Subscribe to our e-newsletter to receive recipes, health tips and updates straight to your inbox. 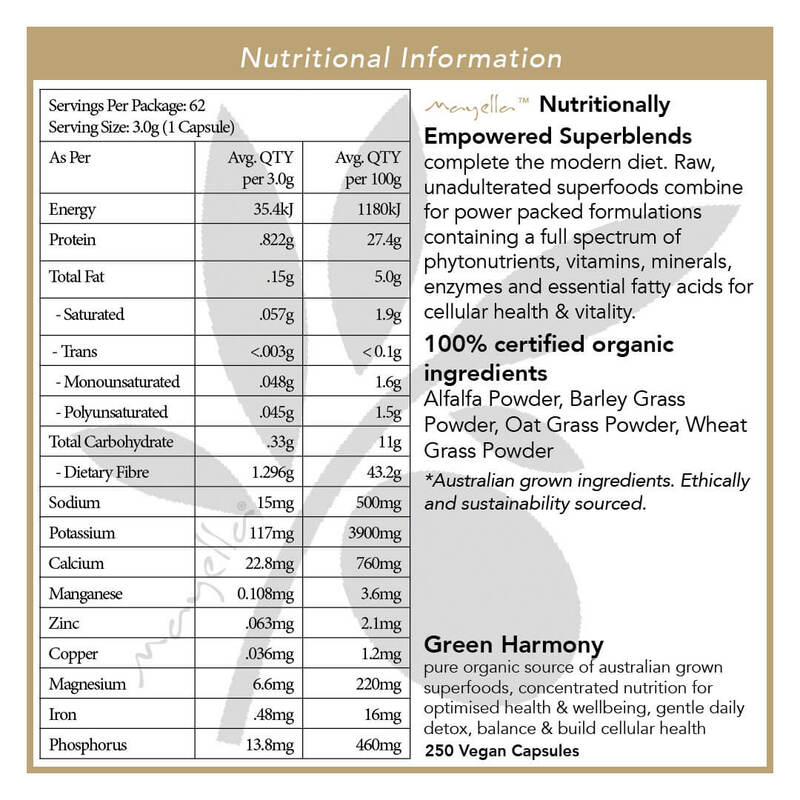 Certified Organic and Australian grown concentrated source of pure unadulterated wheat grass, oat grass, barley grass, alfalfa consciously harvested, ethically sourced and formulated with love in Australia. Mayella ® Green Harmony * – The young green shoots of our grasses are harvested at their nutritional peak prior to maturing into grain and before any “gluten” is formed. High in chlorophyll, stimulating tissue growth and repair with over 90 minerals vital for life. Selenium contained in our cereal grasses is a powerful trace mineral and important in maintaining a resistance to disease, it is also known for increasing antibody production to strengthen the body’s ability to fight abnormal cell growth. Naturally rich in iron and Vitamin C assisting the body to transport and store oxygen in the blood and muscles, produce energy, maintain the immune system and is essential for fatty acid metabolism assisting the human body to detoxify and cleanse. ^ Australian grown only ingredients.